You:nique picture MasterCard is the 1st and only credit card in Malaysia that allows you to design your own MasterCard face and also customize your own card's features. As for myself I would select Great Rebates. 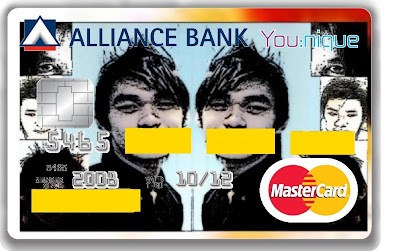 This is because I will always try myself to settle all amount before the due, and with Great Rebates I will be given discount indirectly within all the purchases made by my personalized You:nique picture MasterCard. - Flat finance charge of only 9% p.a.